Prices listed are not per person; prices listed are for chartering the boat. When you charter the boat it is yours with up to 6 passengers maximum in your group. 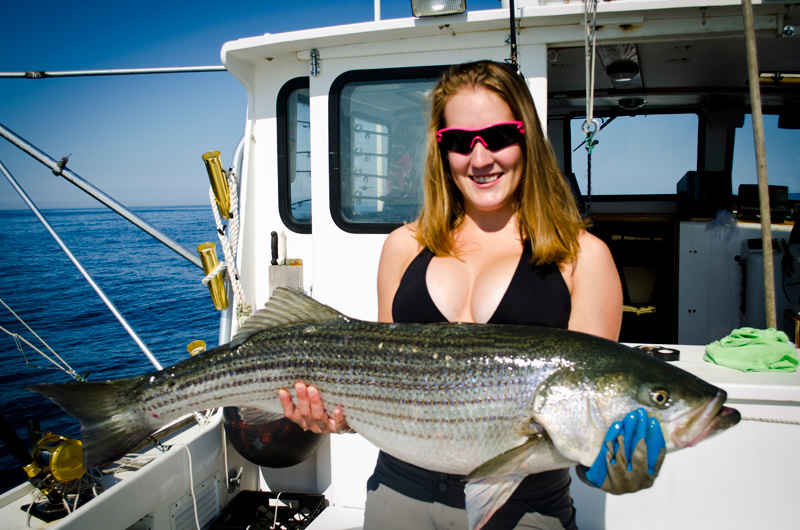 A striped bass fishing charter on Cape Cod is second to none. My old friend, the late Howard T. Miner, would say the Striped Bass is “like a gentlemen in a pin striped suit” and they are truly magnificent creatures. 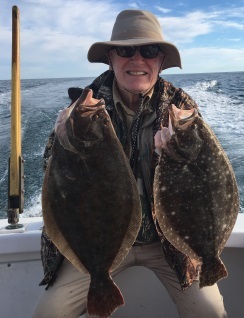 The tide rips on Monomoy and Nantucket shoals off Cape Cod are where they do their business with the crew of the Magellan and we would like nothing more than to show how good fishing on Cape Cod can be. Similar to sea run salmon the Striped Bass are highly evolved. Every spring Stripers spawn in the fresh and brackish estuaries of the east coast and then return to sea. Normally Striped Bass start to reproduce at age six with the majority of the fish spawning in the Hudson River and Chesapeake Bay. Then they return to the waters off Cape Cod because of the abundance and variety of bait. On the Magellan we have found a wide range of bait consumed by Striped Bass including American eels, squid, sand eels, herring, crabs, small fluke, scup, butterfish, small lobsters, small cod, sea robins krill and small mackerel. My professor of marine science and ichthyology at Massachusetts Maritime Academy, the late Dr. Dennis Sabo, was an authority on Striped Bass at the time. Dr. Sabo owned a charter boat that ran out of Falmouth, Massachusetts on Cape Cod called the Peptide and he would spent much of our class time talking about the science of Stripers. We would take field trips on his charter boat and we would tag and release Stripers. Dr Sabo would say that ichthyology is all about fish identification and the best way to identify a fish is to hold it in your hand. He explained that a Striped Bass is really lazy by nature having very little red muscle tissue. And like the ultimate couch potato it wants to get as many calories as possible while doing the least amount of work. 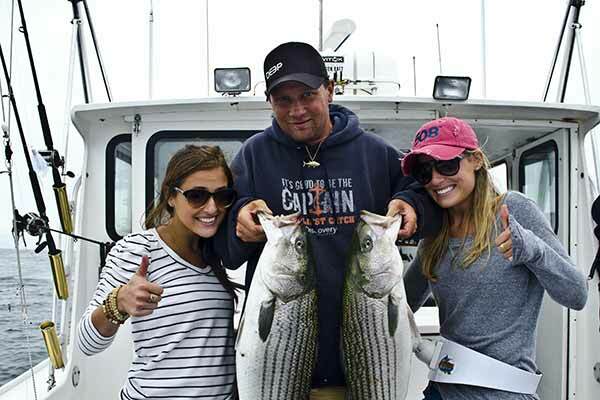 Dr. Sabo would say that you need three things to happen together in order to catch Striped Bass. First, Striped Bass have to be there because only he and Jesus were able to catch fish that were not; second, the fish have to be in the mind set to feed because once they are full they go and lay; and third, there needs to be bait in the area in order to get the bass in the biting mode. When you have all three, watch out because it’s going to be on like Donkey Kong. Just like real estate is all about location, location, location. If it ain’t happenin’ here, the Magellan is off to the next spot. If you have never been in an area where you see Bass that won’t bite, then you have not been chasing them long enough. Dr. Sabo also taught me why the Striped Bass liked to feed in the tide rips off Cape Cod. They are lazy by nature with very little red muscle and the bait is easiest to catch in the rips. Striped Bass will lay behind the turbulent rip like someone on a couch looking out an open window in their living room on a foggy day. When a disoriented bait fish comes flying in through the open window out of the fog, the bass chows it like popcorn. Thanks to Dr. Sabo’s help the crew of Magellan has mastered fishing the rips of Monomoy and Nantucket Shoals. Striped Bass have been known to live in excess of 40 years and grow to over 100 pounds; recently a 95 pound Striped Bass was caught in a net in the Chesapeake Bay. The current pending world record for Striped Bass was caught in Long Island Sound in the summer of 2011 by Greg Myerson weighing in at 81.88 pounds and the Massachusetts state record for a line sider currently stands at 73 pounds. On the Magellan we have caught hundreds and hundreds of Striped Bass. 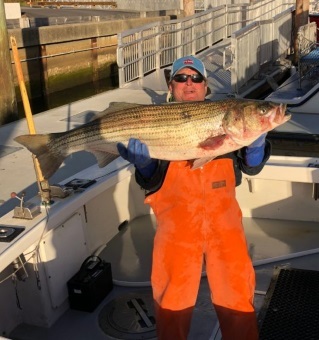 Captain Len’s largest to date is 56 pounds caught in 1991, but, more impressively, Len caught his first Striped Bass at the age of 11 on the beach of Nantucket in 1978. That fish went on to win three divisions of the Nantucket Anglers Club tournament for the year and hooked Len on Striped Bass fishing for life. Come and see the rest of the story: Striped Bass fishing on the Magellan out of Harwich Port, MA on Cape Cod is second to none. Book it today!